No movie buff would want to miss the meeting of two minds who have created some of the most memorable film moments of all time. Ennio Morricone’s prowess with soundtracking the Western is unmatched, and his score for Tarantino’s latest is no exception. “L’ultima diligenza di Red Rock” oozes menace, its drums hitting like interminable train tracks while horns and strings flutter anxiously overhead. As always, Tarantino handpicks perfect accompanying songs, like The White Stripes’ saloon jangling “Apple Blossom” and Roy Orbison’s velvety march “There Won’t Be Many Coming Home,” originally from a cult ’60s Western that starred Orbison. Together with clips of Tarantino’s inimitable dialogue from the film, it’s the perfect thing to whet your appetite for the upcoming bloody epic. 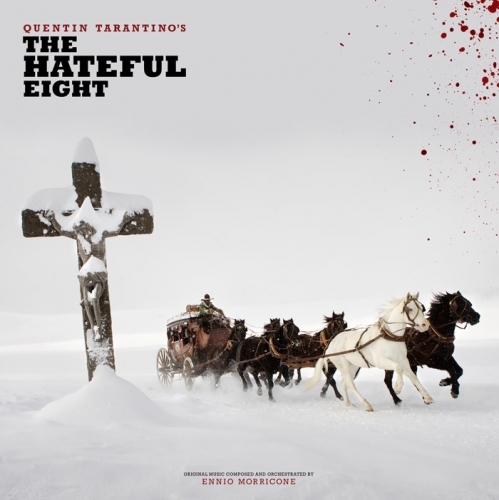 Third Man Records will put out the soundtrack to Quentin Tarantino’s latest film The Hateful Eight. It was composed by the legendary Ennio Morricone — it’s his first score for a Western film in over 40 years, his last being The Good, The Bad, And The Ugly. So, pretty good track record! Morricone’s music has been used in Tarantino’s past films, but this is the first time he’s composed original music for the filmmaker. The standard vinyl edition of The Hateful Eight soundtrack will be pressed 2xLPs, and will contain two posts and a booklet featuring stills from the film. There will also be a limited edition of the soundtrack available sometime in the future, but Third Man are keeping quiet on the details.